The 86th Academy Awards ceremony, hosted by Ellen DeGeneres, will be broadcast live from the Dolby Theatre in Los Angeles starting at 8:30 p.m. ET on various networks. 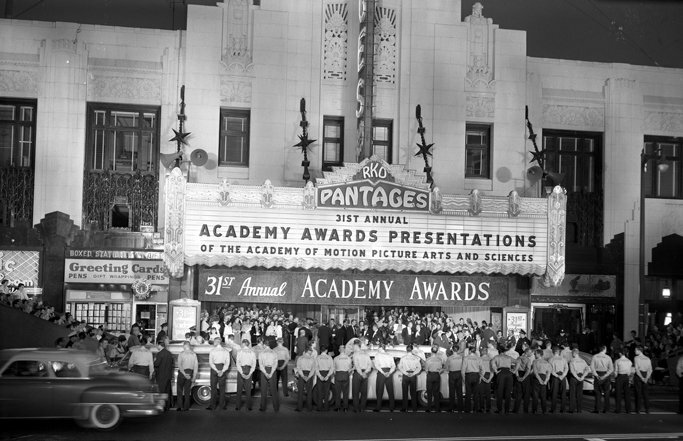 Created as a non-profit organization in 1927, the original Academy of Motion Picture Arts and Sciences was made up of 36 producers and film-makers. Led by MGM studio chief Louis B. Mayer, its membership included such notables as Douglas Fairbanks, Harold Lloyd and Mary Pickford. It now boasts more than 6,000 members, a quarter of them actors. The first Academy Awards were presented on May 16, 1929, at a private dinner at the Hollywood Roosevelt Hotel with an audience of about 270 people. No-one could have predicted when the first Academy Awards ceremony was held in 1929 that it would grow to the huge event it is today. The cost of guest tickets for that night’s ceremony was $5. Fifteen statuettes were awarded, honoring artists, directors and other personalities of the filmmaking industry of the time for their works during the 1927–1928 periods; the ceremony ran for 15 minutes. Fans desperate to see Hollywood’s movers and shakers arriving can do so by sitting on the specially constructed benches erected outside – provided they register at least six months in advance – camping out overnight was banned after 9/11. The lucky 700 selected at random are told to arrive at 07:00 on Oscars day, 10 hours before the fun begins. Every year, the studios launch elaborate advertising campaigns to persuade Academy members to nominate their pictures. Eligible voters are bombarded with DVDs known as “screeners”, occasionally accompanied by lavish promotional material. But new rules introduced in 2012 banned members from attending parties organized by film companies after the nominations are announced. For years, the Oscar oscillated between the Dorothy Chandler Pavilion at the Los Angeles Music Center and the Shrine Auditorium near the University of Southern California. From 2002 to 2012, the Oscars were held at the Kodak Theatre on Hollywood Boulevard, although in 2012, Kodak ended its sponsorship deal with the Oscars shortly before the event. In May this year, it changed its name to the Dolby Theatre in a new sponsorship deal and the Oscars will continue to be held there for the foreseeable future. The time-honored practice of opening the golden envelope to reveal the winner’s name is a pivotal part of Oscar lore. It has not always been so though. For the first 10 years, the Academy informed the press ahead of time in order to accommodate their print deadlines. After one newspaper broke the embargo in 1939, the decision was made to keep the results a closely guarded secret. The Oscars have thrown up more than their fair share of fashion faux pas over the years. Who could forget the bizarre Indian headdress sported by Cher in 1986, or Bjork’s swan gown in 2001, Gwyneth Paltrow was criticized by fashionistas in 2002 for appearing sans bra in a transparent top, as did Celine Dion in 1999 for wearing what appeared to be a back-to-front white jacket. Presenters and performers at this year’s Oscars can be expected to be handsomely rewarded for their trouble with a complimentary gift package thought to be worth up to $100,000. Previous freebies have included such luxury items as mobile phones, high-definition televisions, designer clothes and holiday vouchers. In addition to its competitive prizes, the Academy has a history of presenting special Oscars to ageing stars, industry veterans and well-regarded individuals who have been inexplicably passed over. Recipients include Peter O’Toole, Kirk Douglas and Robert Redford, while regular host Bob Hope was awarded no less than five honorary gongs between 1941 and 1966. The 2013 recipients included Angelina Jolie, Angela Lansbury and Steve Martin. A regular feature of each Oscar telecast is a montage paying tribute to those notables who have died since the last ceremony. A Room With A View screenwriter Ruth Prawer Jhabvala, visual effects maestro Ray Harryhausen, and actors Peter O’Toole and Joan Fontaine are likely to be among those remembered this year. The actor and sometime president of the Academy whose name was attached after his demise in 1956 to an honorary award recognizing individuals “whose humanitarian efforts have brought credit to the industry”. Recipients over the years have included Gregory Peck, Frank Sinatra and, inevitably, Bob Hope. However, since the mid-1980s, it has been doled out sparingly. The first woman to win a best director Oscar for The Hurt Locker in 2010. The film also won best picture. The Oscars cause a mighty traffic jam each year as up to 1,200 stretch limousines queue up to disgorge their celebrity cargo. In 1988, the congestion was so bad outside the Shrine Auditorium that presenters and nominees, among them Fatal Attraction‘s Glenn Close, were forced to ditch their cars and jog down the street to make it on time. Police snipers are routinely positioned on adjacent rooftops, the area is declared a no-fly zone and all the local manhole covers are welded shut. That said, none of this stopped a pair of pranksters getting through in 2002 with the help of a fake limo pass. All films must have at least a token US release before December 31 in order to qualify for the following year’s awards, but it isn’t until the nominations are announced some six weeks before the ceremony that the Oscars race can start proper. The nominees are revealed 05:30 LA time by the current Academy president, usually accompanied by a previous recipient. How the Academy Award of Merit came by its more familiar sobriquet is still a subject for debate, though most people attribute it to Academy librarian Margaret Herrick’s 1931 remark that the award bore a striking resemblance to her uncle. The nickname was in common usage by 1934, but it took another five years for it to be officially adopted. Bob Hope holds the record here, having hosted the ceremony 19 times over the course of 39 years. Johnny Carson was a fixture in the 1980s before Billy Crystal inherited his mantle. This year chat show host and comedian Ellen DeGeneres will host the Oscars for a second time, replacing Family Guy creator Seth MacFarlane, whose close-to-the-bone stint divided critics last year. Part of the host’s job is to poke fun at the Oscars themselves. Organizers need 16,000 square feet of the stuff outside the Dolby Theatre for the annual fashion parade that, for many, is the highlight of the Oscar ceremony. The hallowed carpet is lined with seven-foot Oscar statuettes that are each given a new lick of gold paint before the event; some 60,000 flowers are grown especially for the various floral displays. The record for the longest acceptance speech is held by Greer Garson, who droned on for over five minutes in 1943. John Mills probably made the shortest: in keeping with his Oscar-winning role as a mute simpleton in Ryan’s Daughter, the British actor said nothing at all. The awards were televised for the first time in 1953, attracting the largest audience in commercial TV’s five-year history. In 2005, the ABC network was so worried Chris Rock would swear it imposed a five-second time delay. There have been more than a few of these over the years. Steven Spielberg was gutted when Shakespeare in Love was named best movie in 1999 ahead of Saving Private Ryan, while even Juliette Binoche was shocked when she beat Lauren Bacall to the best supporting actress gong in 1997. Most of the winners make a token appearance at the Governor’s Ball before heading off to a swankier bash. And they don’t come more exclusive than the Vanity Fair party hosted by editor Graydon Carter, which for the last few years has taken place at the Sunset Tower Hotel. During World War II, the Academy replaced its gold-plated statuettes with plaster ones and outlawed formal wear, while concerns over the situation in Iraq were reflected by a toned-down ceremony in 2003. Tatum O’Neal holds the record as the youngest Oscar-winner after she was named best supporting actress for Paper Moon at the age of 10. Anna Paquin came close when she picked up the same award for The Piano at 11. The number of awards Steven Spielberg received for The Color Purple after being nominated for a whopping 11 Oscars in 1986 – an ignominious achievement only matched by ballet drama The Turning Point in 1978. In 2011, True Grit bit the dust, failing to win a single prize despite 10 nominations. The same had happened to Gangs of New York in 2003. Richard Harris was nominated seven times without a single win, but the record is held by sound mixer Kevin O’Connell, who has yet to win an Oscar, despite being nominated 20 times.